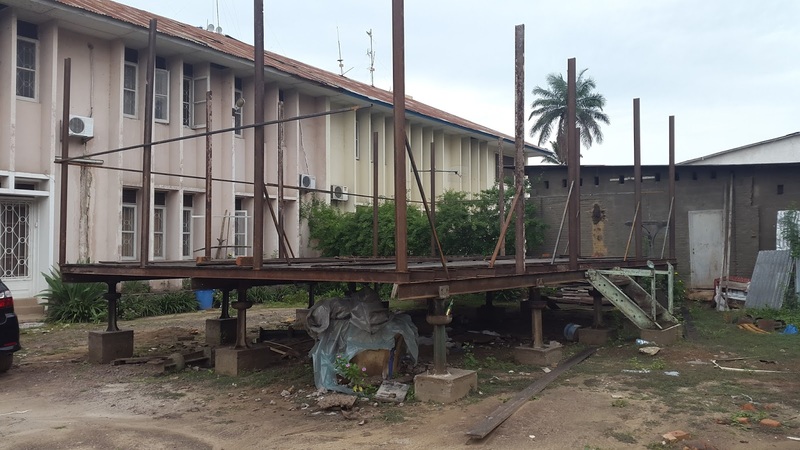 My recent discovery of the pre-fabricated origins of the Chanic Director’s house (See Oct. 22, 2016) led me to wonder about the status of other early pre-fabs in Kinshasa. 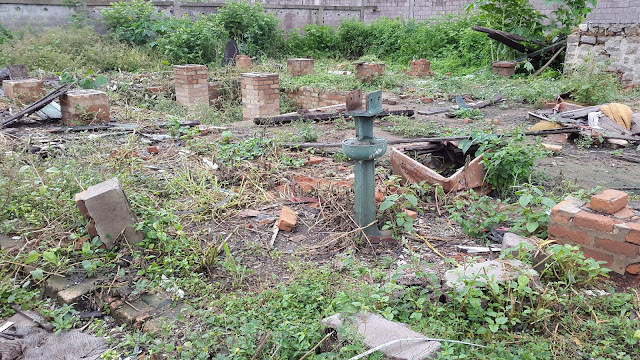 There were two dating from the turn of the 20th Century on the former Baptist Missionary Society (BMS) compound, now the Communauté Baptiste du Fleuve Congo (CBFC) (See Wikinshasa). During the TASOK Fiftieth Anniversary architectural heritage tour in 2011, the two houses were one of the stops on the alumni schedule. 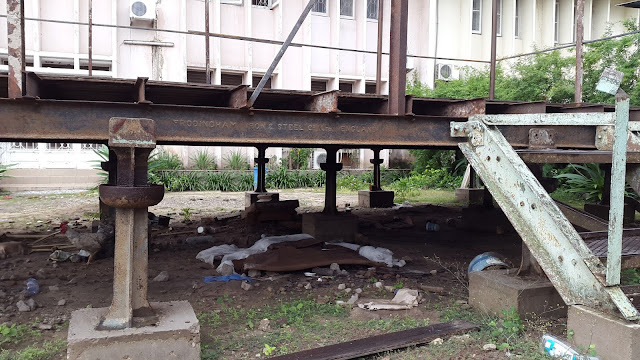 A recent visit disclosed that the two 100-year-old structures have been demolished to make way for speculative building projects. The BMS moved to Kinshasa from Leopoldville (today’s Ngaliema Commune) around 1890 after a grass fire burned down the original mission station located at the top of Mont Ngaliema. The Baptists negotiated with District Commissioner Liebrechts for the property, but paid Chief Nculu (Ngobila) for the land in March 1889. After the fire on Mont Ngaliema, Missionary Thomas Comber recommended building in brick, iron or stone. By 1893, construction of a brick house for Missionary S.C. Gordon was under way. A large brick house for the students, a kitchen and store room were also built the following year. Sales of surplus bricks to local firms such as the “Dutch House” (NAHV) covered the cost of constructing the student housing. Over the next two years, additional brick housing, including a “visitors” house, was built. 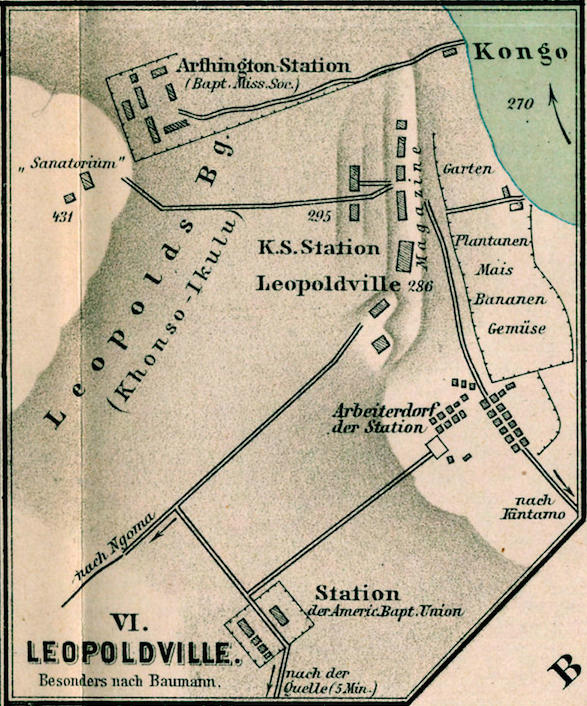 Note original BMS station at top of this 1888 map, the mission was originally named "Arthington" for a benefactor in Leeds. Rev. Comber and Congolese in front of a stick and thatch house. By 1903, the church decided to move its steamer fleet from Bolobo to Kinshasa, in recognition of Kinshasa’s growing importance as a transportation nexus. This also required new housing for the missionaries responsible for the steamers. 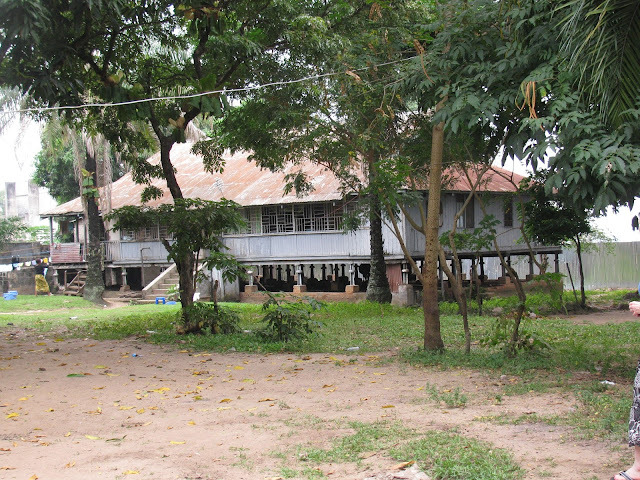 The two pre-fabricated houses ordered at this time were erected around 1907 side by side facing the river in Kinshasa. The structures were fabricated by Frodingham Iron and Steel of Yorkshire in UK and shipped to the Congo in pieces for assembly. 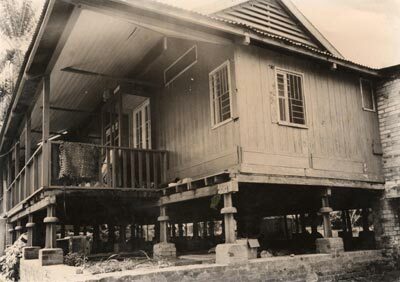 In addition to pine siding and poplar tongue and groove wood floors, the buildings were designed to withstand termite attacks through innovative steel piers incorporating dishes around the structural column which could be filled with kerosene or other chemicals to repel insects. The "Peace" at Upoto just downstream from Lisala in Mongala Province. Notwithstanding the regret a historic preservationist may harbor at this loss of a unique part of Congo’s patrimony, such old colonial structures occupy an ambivalent place in contemporary ex-colonial society. For Congolese, or other Africans or Asians for that matter, such buildings represent a colonial past that is remembered without affection or appreciation of the challenges and sacrifices of the colonials may have made. 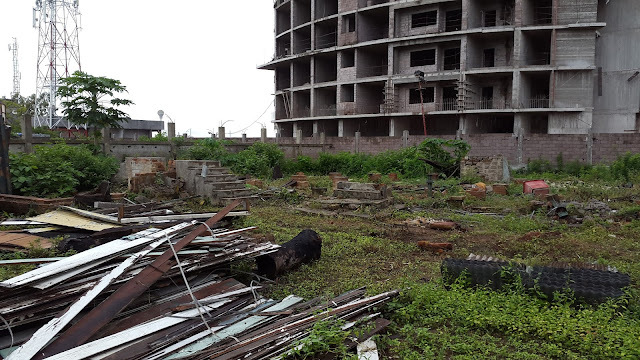 In this particular instance, Congolese did not occupy these houses until years after Independence in 1960. Today, such houses are viewed as outmoded and costly to maintain. Why not use the land they occupy to leverage new residential and commercial development? 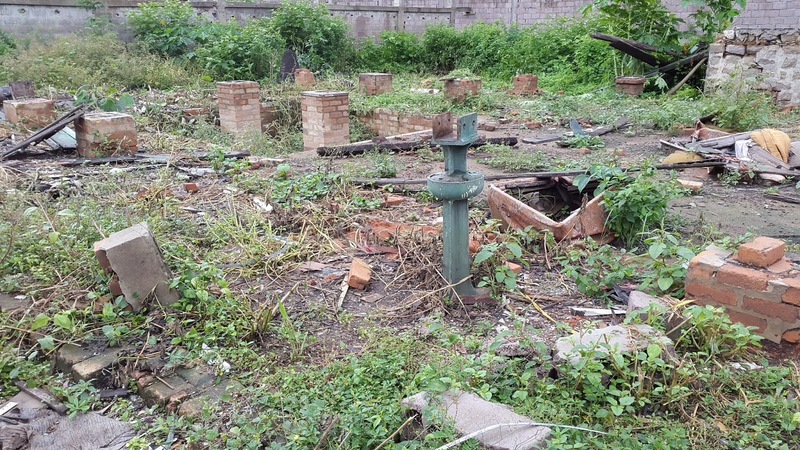 During my recent visit, I found the riverside site cleared of the two houses and the trees that shaded them. Remnants of the original buildings litter the ground. A cement block wall separates the compound from the two Riverside Towers started by Congo Futur which rise along the riverbank. Construction on these is now suspended and the 20-story concrete structures obstruct the view of the river. 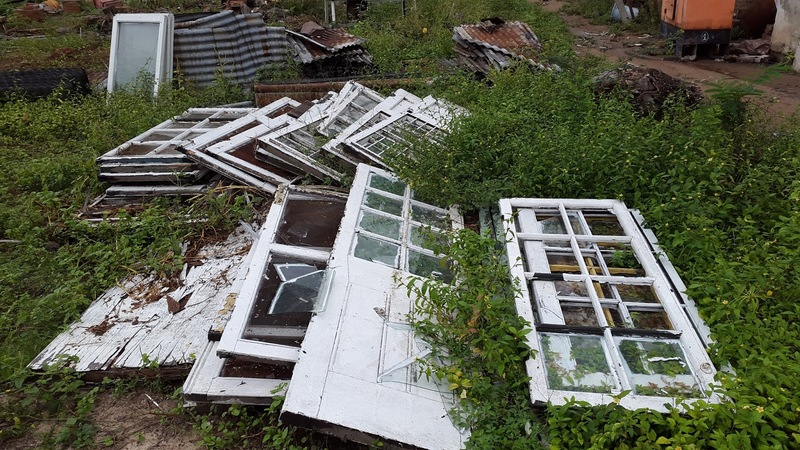 The developer at CBFC has started a project to reconstruct a reduced version of one of the houses nearby, but the advent of the rainy season threatens to destroy the unprotected wood flooring before the developer gets around to putting on the roof. It does not appear to be a priority in any event. The remains of the houses: wooden siding, foundation piers. Congo Futur tower in background. Re-erection of part of one house. Note Frodingham Iron & Steel on the girder. In June 1909 Charles Pugh, a young BMS missionary on his way to the upcountry station of Yakusu, arrived in Kinshasa. 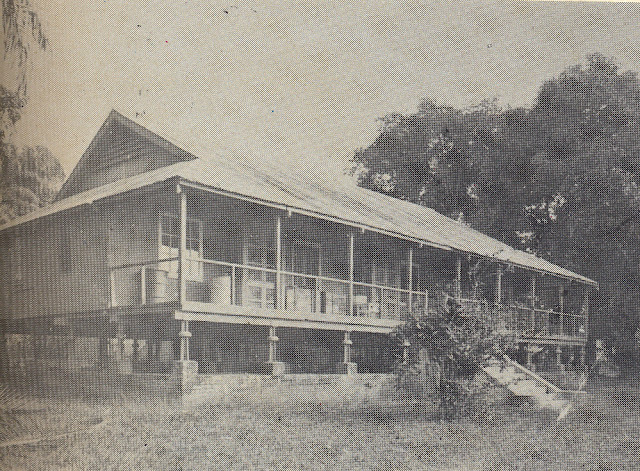 Pugh, who would eventually become the long-serving Legal Representative of the BMS in Leopoldville, later described his initial visit, walking on foot from the train station to the BMS mission whose main purpose “was to keep this base transport station functioning effectively… Here, amid many signs of activity, were found the homes of those who for so long had splendidly maintained the fine traditions of this Stanley Pool Station. Kinshasa in 1909. BMS mission compound at extreme left. A rider on a "pousse pousse" of the era. As noted, an important factor in the development of the BMS mission in Kinshasa was the decision in to relocate the steamer fleet from Bolobo. 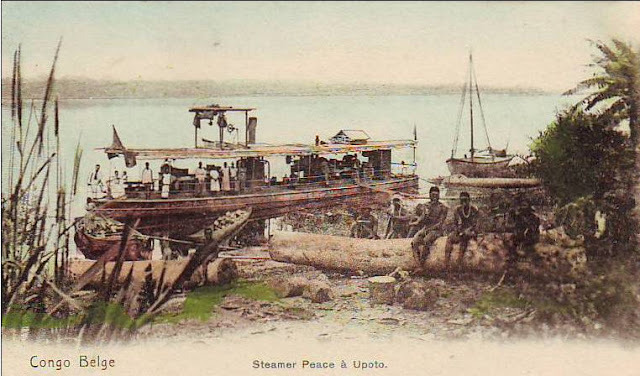 A first steamer, the “Peace” was launched at Leopoldville in 1884 (See May 4, 2015). For a number of years the boat was based at Bolobo, but it was transferred to Kinshasa in 1903, where it continued to serve the upriver stations under a full time missionary until 1908 when it was decommissioned. The BMS later launched the “Goodwill”, the “Endeavour” and finally the “Grenfell”, at the Mission in 1912. As part of the deal to sell 20 hectares of mission property to H.C.B., Lever Brothers agreed to allow BMS passengers and cargo access to its own steamers, obviating the need for the mission to continue to operate its own fleet. The launch of the steamer "Grenfell" at the BMS beach in 1912. The "Endeavour" in the background. After the Peace was decommissioned, the bow and forward sections of the craft were shipped back to Britain to be used for fund-raising purposes. 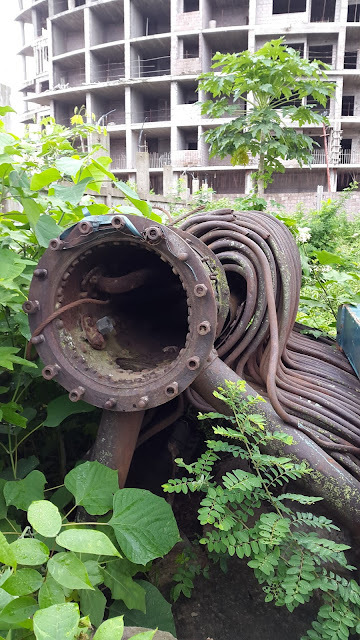 The heavy boiler was left at the river bank and settled into the mud as it was submerged during successive annual rainy seasons. 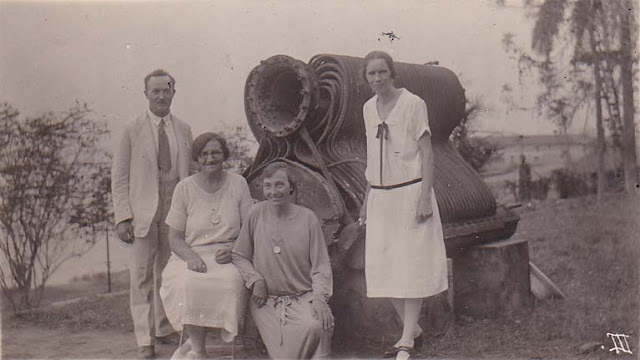 When Pugh returned to serve at the mission in the late 1920s he placed the boiler on the mission grounds near the two pre-fabs as a memorial to the pioneer missionaries. The steam boiler of the "Peace" on display on the riverbank around 1927. The man at left may be Charles Pugh. Looking around the site, I finally located the boiler rusting away in the tall weeds. If the CBFC church does not see any value displaying the boiler in its compound (the developer did name the apartment building facing Ave. Kalemie, “The Peace” -- See Aug. 17, 2016), the boiler and some of the steel components of the houses (such as the termite-resistant piers) could be donated to the new National Museum under construction on the Boulevard Triomphal. One of the steel piers designed to thwart termites. Footnote: In the course of the research for this post I happened upon some interesting Congo trivia. 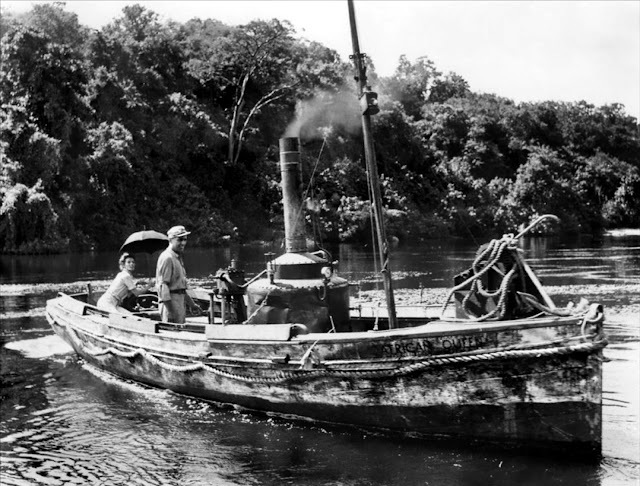 The boat used in the Humphrey Bogart and Katherine Hepburn film, “The African Queen” filmed in Kisangani in 1951 was also built by Frodingham Iron and Steel in 1912 for service in the Congo. Pugh, Charles E. “A Kinshasa Weekend 1909”, Congo Mission News, October 1956. Wilson, Charles Edward. 1920. 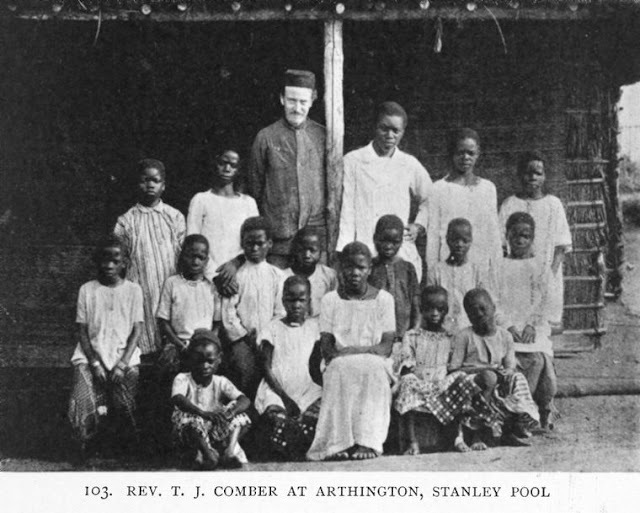 After forty years: A missionary embassy to Congo, May-November, 1919, Baptist Missionary Society. Dear Mwana, I found this post fascinating. I am currently researching the activity of the BMS in Equator district from c.1880 and had been wondering what had become of the permanent and semi-permanent structures they built. Astounded to see the Peace's boiler - particularly as other parts of the Peace have been preserved in museum collections as relics of the BMS endeavour. I would be keen to hear more about your research. Hi, thank you for the pictures and also the research they illustrate. We lived in one of the two wooden houses on the CBFC (then Z) compound in Kinshasa from 1982-1991. Two details may interest you. During repairs we found that many of the wooden planks of the walls had "BMS house Kinshasa via Matadi" stenciled on the back. The two houses had their metal "dishes" oriented in opposite directions. In you pics 4 and 6 the "dish" clearly faces down) and cf. 10 where it face up. We speculated that this was an experiment to see whether it was better to deter rats (facing downward, the right hand house when facing the river) or termites (facing up and as you suggest filled with oil, te left hand house next to the parquet). Oops, I got my left and right the wrong way round above.